This month saw the first EU Stage V engine coming off the production line at DEUTZ, a specialist in off-highway drive systems. The new emissions directive comes into force in 2019. In autumn 2017, DEUTZ was the first engine manufacturer in the world to be given an EU Stage V certificate. 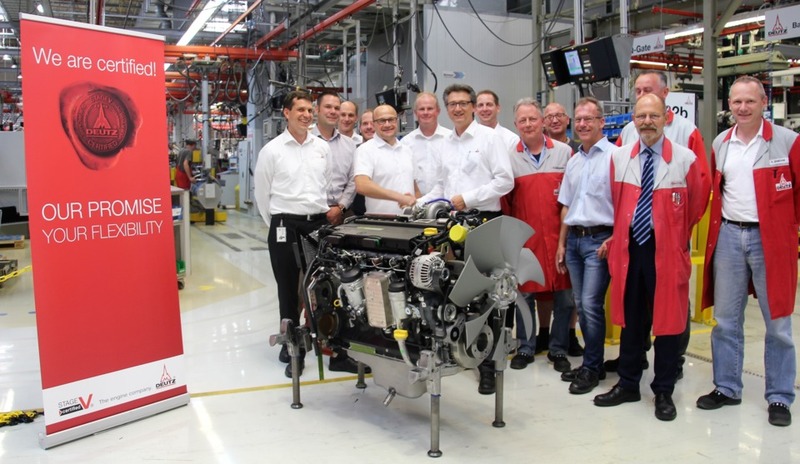 And now, with this first production engine, DEUTZ is re-affirming its EU Stage V promise. As long ago as 2015 – four years before the new standard would enter into force – DEUTZ let its customers know that the current generation of engines already met the expected EU Stage V standard, and introduced the ‘Stage V ready’ seal. Then, after certification on 6 September 2017 by the German Federal Motor Transport Authority (KBA), ‘Stage V ready’ became ‘Stage V certified’. The first official EU Stage V engine is a DEUTZ TCD 6.1. This six-cylinder in-line engine with a cubic capacity of 6.1 litres and generating 180 kW was assembled in the Cologne-Porz production plant. The EU Stage V standard specifies a particle number limit which can only be achieved by using a diesel particulate filter (DPF). Operating a DPF demands in-depth knowledge of the relevant application. The load profiles are completely different depending on the equipment in which the engine is installed. An intelligent ‘Heat Management’ system is needed in order to be able to burn off the particles collected in the DPF. DEUTZ has consequently developed what it calls a ‘Heat Mode’ to specifically raise the exhaust-gas temperature and to ensure the machinery is operated safely. This development is one way in which DEUTZ has been able to demonstrate its technological lead in the field of exhaust after treatment. Early certification and delivery provide DEUTZ’s customers both with flexibility when integrating the EU Stage V engines into their equipment and with planning certainty when changing over to the new stage. At the same time, DEUTZ is keeping its environmental promise and positioning itself as an ecologically oriented engine manufacturer. As part of its E-DEUTZ strategy, DEUTZ is also introducing electronic drive components into its low-emission combustion engines in order to increase efficiency still further. The aim is for DEUTZ to be the market leader for innovative drive systems in the off-highway sector.